Our master classes are a series of informal, drop-in sessions where you can get an impression of what we offer and our approach. Events are added regularly and take place across the Netherlands. Weekly Raja Yoga class: the eight limbs of yoga. During each yoga lesson we go briefly into one of the eight limbs: Yama: moral codes, Niyama: personal discipline, Asana: body postures, Pratyahara: withdrawal of senses, Pranayama: control of prana, Dharana: concentration, Dhyan: meditation, Samadhi: spiritual absorption. I am an experienced scientist in medical biology and a student-teacher in the teacher training programme of the ancient (>2500 year old) Himalayan Yoga Tradition (Raja Yoga). Weekly Raja Yoga class: the eight limbs of yoga. Tijdens elke yogales zullen we kort de acht ledematen van yoga behandelen. Yama: morele codes, Niyama: persoonlijke discipline, Asana: lichaamshoudingen, Pratyahara: terugtrekking van zintuigen, Pranayama: controle van prana/ademhalingsoefeningen, Dharana: concentratie, Dhyan: meditatie, Samadhi: spirituele absorptie. 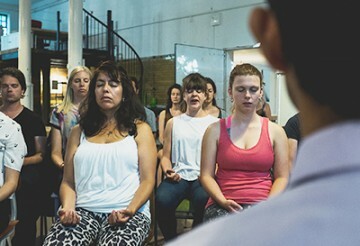 Ik ben een ervaren wetenschapper in de medische biologie en een student-teacher in het teacher training programma van de eeuwenoude (>2500 jaar oude) Himalaya Yoga Traditie (Raja Yoga).